Cell phone companies typically do not offer unlimited data plans anymore. Unlimited plans were offered in some markets when only 3G was available, but with 4G, users can use up large amounts of GB in a short time. This usage creates a strain on the cellular network as its capacity is not unlimited. Also, in developing countries, unlimited data plans are not usually offered. Therefore, it is in your interest to take steps to reduce your data usage so that you do not run out of MB. Google Data Compression Proxy can help you use less data on your phone. This browser plug-in intercepts web pages and reduces the size of the graphics. This saves you about 30% on data usage. Not all web pages size their graphics correctly to fit the browser. For example, a website transmits to you a 1MB image (when 35KB is all you need to see the picture clearly). When the browser receives the oversized image, it resizes the image anyway to match the instructions in the web page or your screen size. All of that is wasted bandwidth. 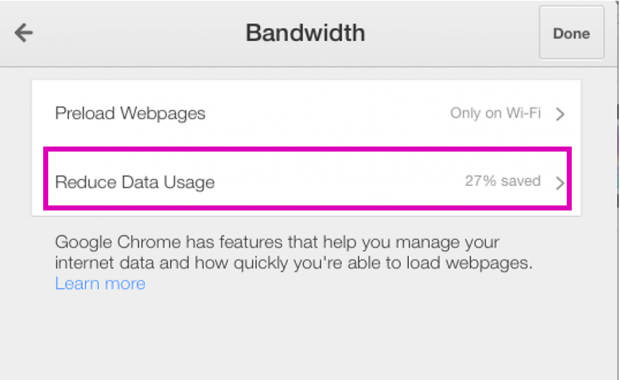 Here is now to set up the Data Compression Proxy with Chrome on Windows and on the iPad. 1.Go to this URL to add the extension to Google Chrome. Click where it says Free to install. 2.Now, the Data Compression Proxy is installed. 3.To disable or enable it, click the green icon at the top right of the Chrome browser. On certain websites, the icon will automatically change to red. The icon changes to red for pages that cannot be displayed via the proxy. This would be the case for something that is not in its cache such as your bank statement. The icon will turn green automatically when you are on a website that can be viewed with the proxy. 4.Click the link below to see how much data you have saved. 1.Install the plug-in as shown above. There is no green icon on the iPad version. Instead, press the settings icon at the top right-hand corner of Chrome and select Settings. 2.Now, scroll down to where it says Bandwidth. 2.Turn on or off the Reduce Data Usage option. As you can see, it shows you the bandwidth you have saved. As an alternative, you could also use the Opera Browser which works on the same principle.